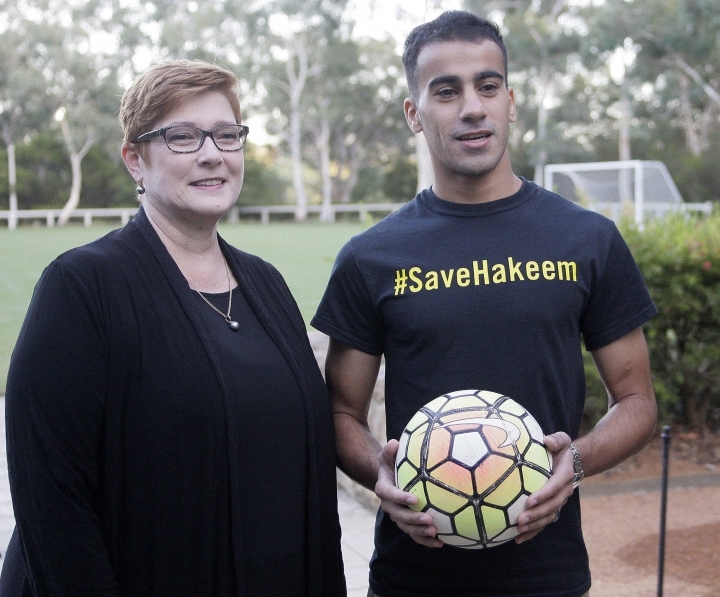 CANBERRA, Australia — A refugee soccer player who was detained in Thailand for three months under threat of extradition to Bahrain shook hands Thursday with Australia's prime minister, whom he credits with securing his freedom. 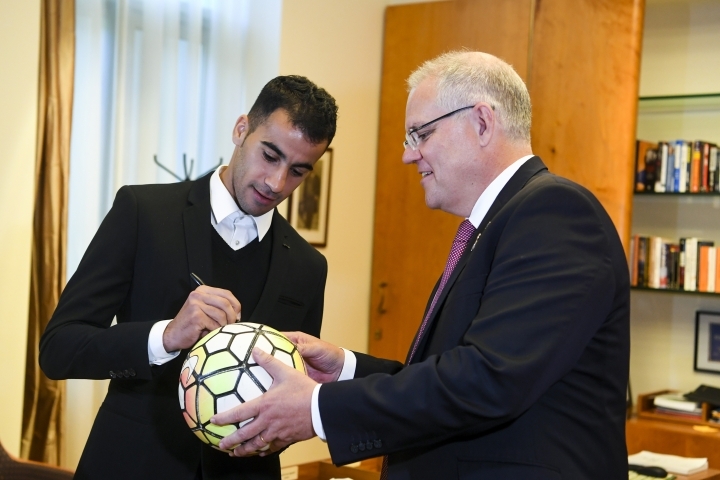 Three days after he was released from a cramped Bangkok cell, Hakeem al-Araibi was welcomed into Prime Minister Scott Morrison's ornate office in Parliament House. Morrison and Foreign Minister Marise Payne had repeatedly lobbied the Thai and Bahrain governments on al-Araibi's behalf for his return to Australia where he is a permanent resident. "Thank you very much. I'm so happy to be back in Australia now and I'm grateful to be here to live in this country," the 25-year-old said. Morrison said he was pleased al-Araibi had come home and looked forward to him soon becoming an Australian citizen. Al-Araibi had arrived in his home city of Melbourne on Tuesday on a flight from Bangkok where he had been detained since November following an extradition application from his native Bahrain. 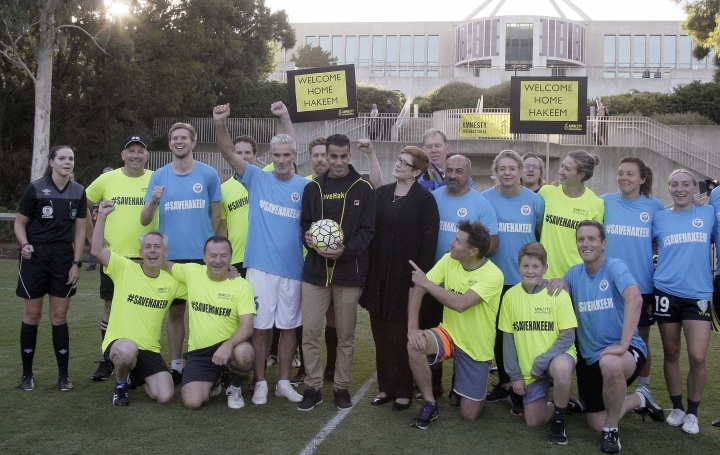 He came to Parliament House on Thursday morning to watch a soccer match played by lawmakers, supporters and stars of the Australian national women's team wearing the yellow uniform of Amnesty International and the blue of al-Arabi's Melbourne team Pascoe Vale Football Club. The former Bahrain national team player watched from the sidelines with the foreign minister, explaining that his hamstrings remained too tight after weeks in a crowded cell to play. The soccer match had been planned as a demonstration of support for al-Araibi when he faced indefinite detention. But instead, it became a celebration of his release. Former Australia national team captain Craig Foster had been a leader in the campaign for al-Araibi's release and played for Pascoe Vale on Thursday. "We're all very worried about him," Foster said. "He's obviously riding on incredible adrenalin and elation. " Bahrain wanted him to serve a 10-year prison sentence in an arson attack that damaged a police station. He has denied those charges and says the case is politically motivated. Al-Araibi was detained by mistake upon arrival in Bangkok on his honeymoon. Interpol rules do not allow refugees to be deported to the countries from where they fled persecution. He was released when Thai authorities shared a letter indicating that Bahrain had withdrawn its request for al-Araibi. Officials in Bahrain said the country "reaffirms its right to pursue all necessary legal actions against" al-Araibi.